Take your best shot with your new Nikon D3300 Congratulations on your new Nikon D3300 DSLR! You probably want to get shooting right away, but first you need to know some basics about the controls and functions. Take your best shot with your new Nikon D3300 Congratulations on your new Nikon D3300 DSLR! You probably want to get shooting right away, but first you need to know some basics about the controls and functions. Nikon D3300 For Dummies is your ultimate guide to your new camera, packed with everything you need to know to start taking beautiful photographs right out of the gate. Author Julie Adair King draws on a decade of experience in photography instruction, specifically Nikon and Canon, to walk you through the basics and get you started off on the right foot. Your new Nikon D3300 offers full control over exposure settings, but it also includes pre-sets and auto mode options for beginners. Nikon D3300 For Dummies guides you through the specifics of each setting, and teaches you how to determine what controls work best in a given situation. Written specifically for the Nikon D3300, the book discusses only the controls and capabilities available on your model, and shows you where to find them and how to use them. Topics include: Shooting in auto mode, playback options, and basic troubleshooting Working with light, focus, and color, and conquering video mode Picture organization, including file transfer and sharing Tips on photo editing and select features This full-color book includes a variety of photos that demonstrate the effects of different settings, allowing you to develop an eye for matching controls to situations. 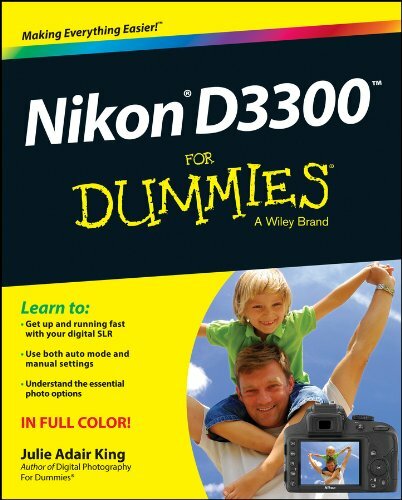 If you want to get the most out of your new DSLR, Nikon D3300 For Dummies is the best, most complete guide on the market.